Is Robinson Cano on his Last Legs in New York? 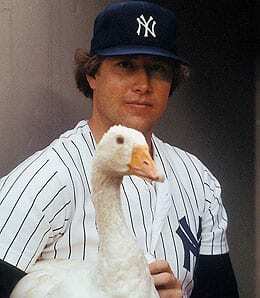 Rich Gossage thinks any writer who votes for a cheater is a silly goose. Robinson Cano has been studly for the Yankees for many years (winning his third straight Silver Slugger last year) and with free agency pending after 2013, something has to give. He’s in the final year of a deal that will pay him $15 million in 2013, but you have to know he’ll want A-Rod money after this year. However, the Yankees are hell bent on trimming their payroll to $189 million by 2014. Something has to give here, and it will be a fascinating storyline to follow this year as we see what will happen with the future Hall of Famer. Speaking of Hall of Famers, the 2013 class will be a lonely one as the voters failed to elect a single player for just the second time in 40 years. Barry Bonds, the all-time home run hitter with 762 majestic (if PED-aided) blasts? Nope, didn’t make it. Roger Clemens, who has more Cy Young Awards than anyone? Nay. Sammy Sosa, eighth on the all-time home run list? Not even close. Also in his first try, Craig Biggio was just 39 votes shy of enshrinement, but no cigar. Wow. Impressive candor on Goose’s part. But how can anyone argue with a single point he makes? Were baseball writers correct in refusing to allow any of this current crop into Cooperstown? This entry was posted on Thursday, January 10th, 2013 at 12:40 pm	and is filed under BASEBALL, Fantasy Notes, RotoRob. You can follow any responses to this entry through the RSS 2.0 feed. Both comments and pings are currently closed. Thanks for sharing, Steve. I totally hear what you’re saying. I’ve been worried about this moment for years — how do we compare the achievements from the steroid era to the rest of history? The answer is we don’t. Not to oversimplify things, but my solution: assume they were all juiced, select the best players of the era and put them in the Hall and move on. I just don’t think there is a fair way to deal with this situation. Now you’ve got Craig Biggio moaning that he’s not in because he’s been grouped in with the alleged cheaters. What a mess!